Like fans of Manchester United and City, Arsenal and Tottenham, and Everton and Liverpool, there's a choice to make in the world of football simulators, and once you've made it, it's treason to renege. That's the way it has always been, when it came to Pro Evolution Soccer and FIFA, by far the two greatest football games ever released. The seventh generation of consoles is now upon us, which means that the sixth - which includes the PS2 - is starting to get left behind. But another year means another Pro Evolution Soccer (and FIFA) release on the PS2, and it's another highly enioyable one at that. That said, PES 2009 is not without its flaws. The ability to play the game online has been scrapped from this release, no doubt as an incentive for fans to pick up a new PS3 instead. There are also some missing players (Albert Riera is one), and while the transfer of Dimitar Berbatov means that he appears at Manchester United, Fraizer Campbell, who went in the opposite direction, is nowhere to be found. Furthermore, the usual rights issue preclude Konami from using all but the name Manchester United and Liverpool for their English league. Instead, you'll find "North London" (Arsenal) and "The Potteries" (Stoke City). Just be thankful for the in-game editor. One thing the editor can't handle, however, is an apparent infrequent bug in substitutions, which sees the player that you wish to bring on to the field locked out of your squad. While this has been confirmed by several sources, Konami have yet to make a statement regarding the problem. With all that said, you would think that PES 2009 isn't much of a game, but it is in the gameplay that this one shines. While graphically it looks exceptionally similar to PES 2008, the play is smoother, and there's a feel that the players are actually more under your control than ever before. Shooting, in particular, has been improved, as has the players' control of the ball. With that, it's a little simpler to create footballing masterpieces to rival Brazil's legendary goal against Italy in the 1970 World Cup Final. The regular Master League feature is present and correct, allowing you to take up somewhat of a management role while playing, building up a winning squad by wheeling-and-dealing with the best of them on the transfer market. But a new feature entitled "Become A Legend" is an interesting new concept, in which you can create a 17-year-old player, and control only him, as you work your way up the football ladder, hoping to be signed by the top clubs in the game. The real challenge of this is playing the game from a camera angle which shows the game play out vertically rather than horizontally, and with enough of a close up that it isn't so easy to see everything that's going on around you. 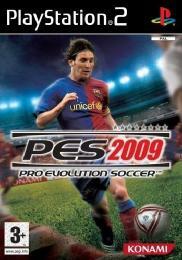 Overall, if you are looking for a radically different, wholly-improved PES 2009 to replace PES 2008, I'm afraid you're looking in the wrong place. But - substitution bug aside - this game plays better than its predecessor, and that might be just enough to swing you into this PS2 version, before the pressure is piled on once again to replace your aging console.